Twenty kids divided into ten teams participated in our last event of the year, our Bughouse Marathon. The kids came up with their own team names ranging from the intimidating “King Cobras” to the unique “POWLS”. 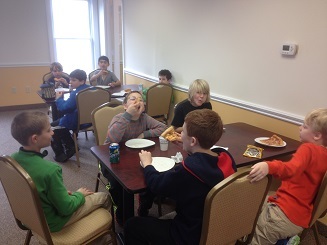 The five hours of bughouse were only interrupted by a brief pause for pizza. Throughout the tournament there were many exciting games and unexpected finishes. 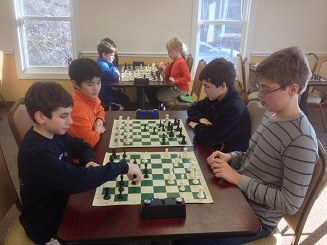 The K-8 section was won by the team composed of Henry Stratakis-Allen and Alex Mayo. Two teams tied for second place. They were the team of Alex Huggins and Zachary Groz as well as Adam Boczar and Ben Walker. The team of Filip Graham and Leo Koganov came out on top in the K-5 section. They narrowly edged out the King Cobras comprised of Sam Forfang and Ryan Roderick. The team of Alexander Tu and Max Fujimori finished in third.